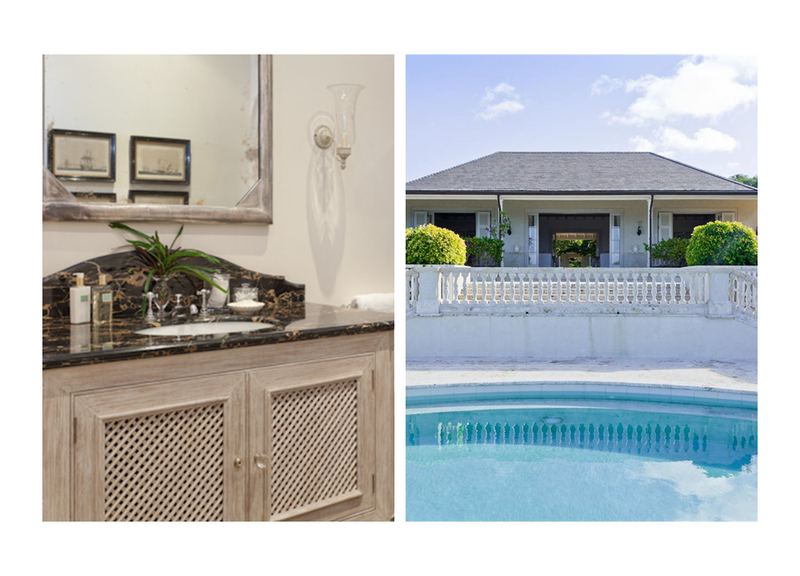 Villa Plantation House, also known as MV PLA, is a 6-bedroom villa located in Hillside within a short drive of several beaches. Perched high in the southern hills above Lagoon Bay, this villa recently featured in Architectural Digest offers spectacular, panoramic ocean views. Four bedrooms, a TV room and dining room flank the entrance hall and inner courtyard, which opens to the villa’s focal point – a massive great hall perched above a 2-tiered terrace, hillside swimming pool, dining terrace, and gazebo. Elegantly furnished, the spacious living room has a high ceiling, while the stunning dining room accommodates 6 guests underneath a dramatic chandelier. The Edwardian Collection fits perfectly with the overall interior design of the villa, enhancing the luxurious experience in the bathrooms. Mustique Villa Plantation House Light Marble Bathroom featuring Czech & Speake Edwardian fittings.